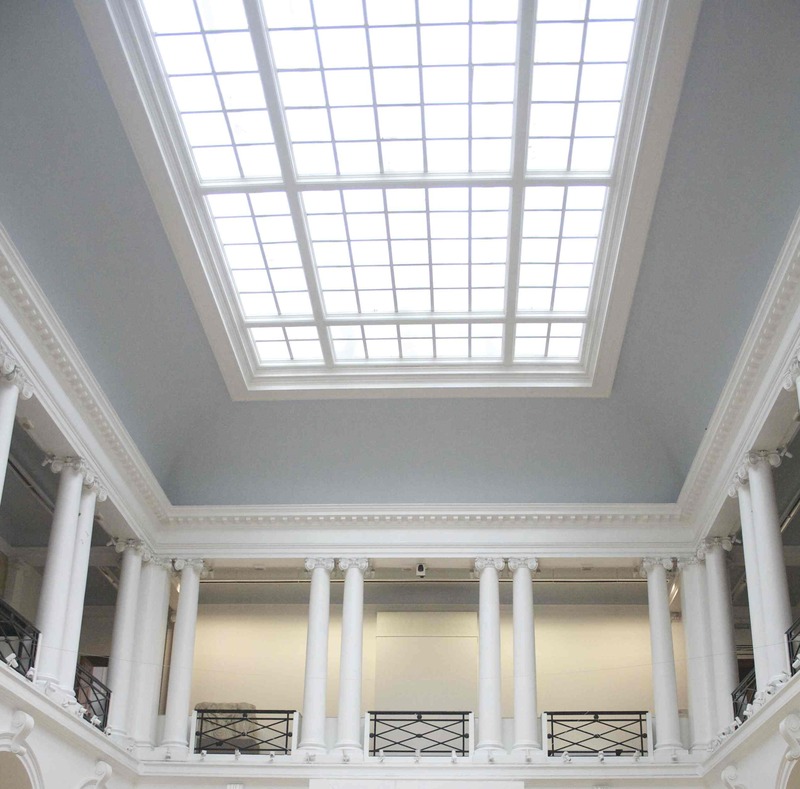 I’ve begun preparations for Trace, 2015 – a new, part-improvised, group-vocal acoustic performance work that I’m creating within and in response to the vast, neo-classical ‘Adam Dome’ of H.M. General Register House. 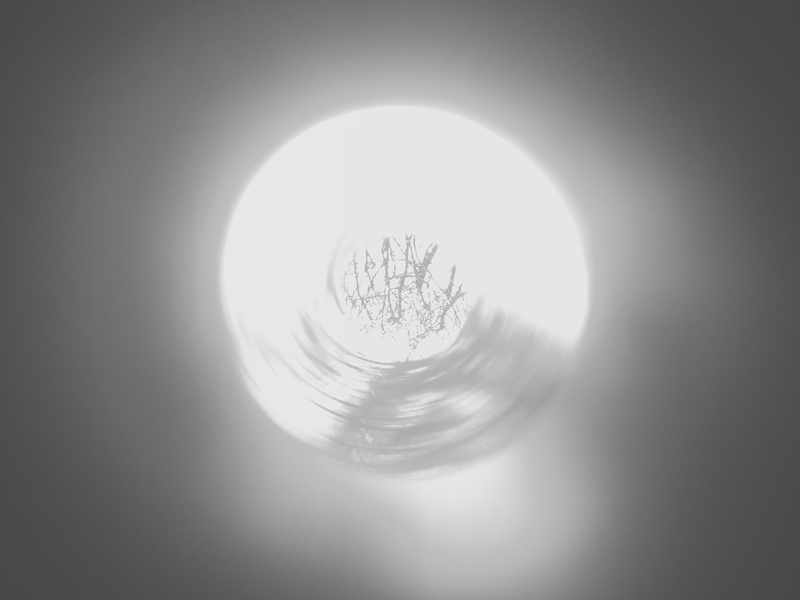 The idea for the work emerges from the experimental vocal process I’ve been developing of ‘opening up’ and ‘re-articulating’ relationships with space and place in the immediate and intimate moment that each work is made. 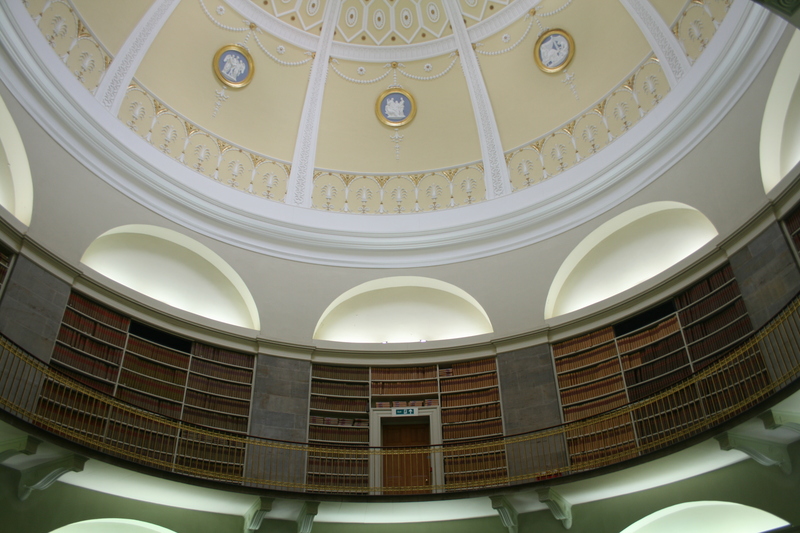 I’d been thinking about potential spaces in Edinburgh, and took the Edinburgh Art Festival’s open call for participants as an opportunity to put forward the 250 year old dome of HM General Register House in central Edinburgh as an unusual, one-off venue. This was also the catalyst I needed to bring together a set of vocalists with whom I could collaborate specifically to develop the work. The place, that is both the inspiration and the location of this site-specific work, is Scotland’s purpose-built, working archive of personal history. The repository of Scotland’s registers of births, marriages and deaths. It is where the forgotten and the lost may be remembered and found – the place where hope there is some trace of ourselves – where we came from and who we might be. This will be a 20 minute durational performance that evolves moment-by-moment through a dynamic interchange between the vocalists and the acoustic dynamics of the space, and people who are present. Importantly. there will be no special seating for the performance. The audience will be able to move and experience the shifting quality of the sound from different positions within the room, with their movement, in turn, influencing the performance of the vocalists and the acoustics of the room. Listen to recording of ambient and performed sounds in a public place. I am working with-non verbal vocalisations, involving groups of performers. Traditionally, vocal performances are recorded in environments in which the only sounds that interrupt the ‘silence’ are those designed to accompany the vocalists. By contrast, my group performs in random public environments where, by definition, we cannot exert any control over the ambient sounds. When you stop to listen, our environment is a rich array of beautiful, enigmatic and evocative noises. It is into this that we randomly perform, capturing the immediate acoustic qualities of the landscape of which we are a part. Listen to Translation, 2014 (shortlisted proposal). This is a site-specific sound piece in which I use rhythmic breathing to replicate the dots and dashes of international morse code. A single word is repeated – translation – meaning both a change of form or state and the ability to traverse languages and space. The word translation, itself translated into the dots and dashes of morse code, emerges as a rhythmic sequence of breaths, deep and slow, short and quick. Amplified, the different breaths ebb and flow, resonating within the tower. Working together, they coalesce to form an immersive and shifting soundscape. Liberated from the body, they are free to enter their own dialogue with the physical space. While each breath carries no visual reference to its source, within the tower the entire visual field, with its vertical expanse of poured concrete and shaft of light from the vent high above, is rich in the symbolism of modernity and traditional industry. This space alludes to the chimneys of power and production, to pistons and locomotion and to the percussive sounds of gases pumping and steam venting – to the inhalations and exhalations of industry. In establishing a dialogue with the physicality of the new building for which it is proposed, this sound piece engages with the ideas inherent in its original concept and design. With the breath, it recognises the role of effort in all human ingenuity and creativity, and power of connectivity and communication. ‘Hearing is a physical process, listening is a psychological act….Listening is an art.’ Robert Worby In his excellently succinct essay An Introduction to Sound Art, Worby refers to the process of active listening, as opposed to passive hearing, as ‘auditory creativity’. In my view, if the source of the sound – live or recorded – is visible to the listener then the opportunity for this ‘auditory creativity’ and, therefore, creative engagement, is lessened. We are simply hearing what we would expect from the visual source – a process of identification and verification – an end point. Sound art, as opposed to art-with-sound, is striving towards creative listening, not passive hearing. It goes beyond straight documentation of an event in sound as well as vision. It is work where the sound itself provides the richest source of meaning, and where that meaning is experienced through creative emotional engagement. Impediment to listening casts an auditory shadow over the work, obscuring our ability to perceive and engage with it. While I am thinking and making sound works I think often of the parallels between the media of sound and paint – tones and rhythm link directly to hue and stroke, with notions of composition and narrative common to both. Taken into the ‘gallery’ the comparison remains valid. Tradition has it that once curated, pictures remain fixed in position on the walls, obstacles to their viewing are restricted and the light levels during gallery hours are kept optimal and constant. If we substitute the sensory medium of visible light with audible sound, the principles of curation remain essentially the same. 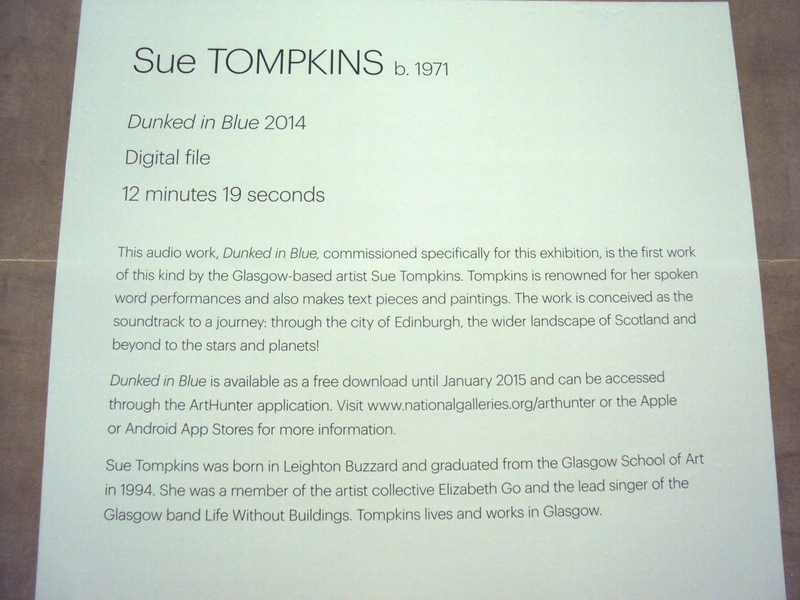 The sonic environment in which the sound work is presented is organised and managed to give the audience a reasonably sonically unobscured and constant experience of the work. Overlaying two works in the sonic field, for example, has its equivalent in the hanging of two paintings overlapping one another. And so on. The title raises issues central to the question of the credibility and feasibility of sound as a medium per se in contemporary art – whether the sound is part of a mixed-media work (ie an installation also involving physical object/s, light etc), a performance work, or a sound-only installation. The approach of Joe Bank’s immersive, audio installation (Disinformation) undoubtedly brought the focus of attention to the field of sound art that emerges from acoustic design and digital music. This field is well represented and documented in art publishing, and more broadly in sound-art events. But, as James Clegg, assistant curator at Talbot rice summarised in his introduction, sound in art has a fascinatingly long and mixed pedigree – emerging from music, performance, sculpture and, most importantly, from the fertile gaps, the liminal places, in between these now unfashionably limiting categories. This, for me, is the truly diverse and fascinating pedigree of sound in the visual arts. But, I find myself questioning whether, in spite of the emergent popularity of sound per se, sound is really understood and accepted as a credible medium, among media, in this way. Its reputation as problematic remains. 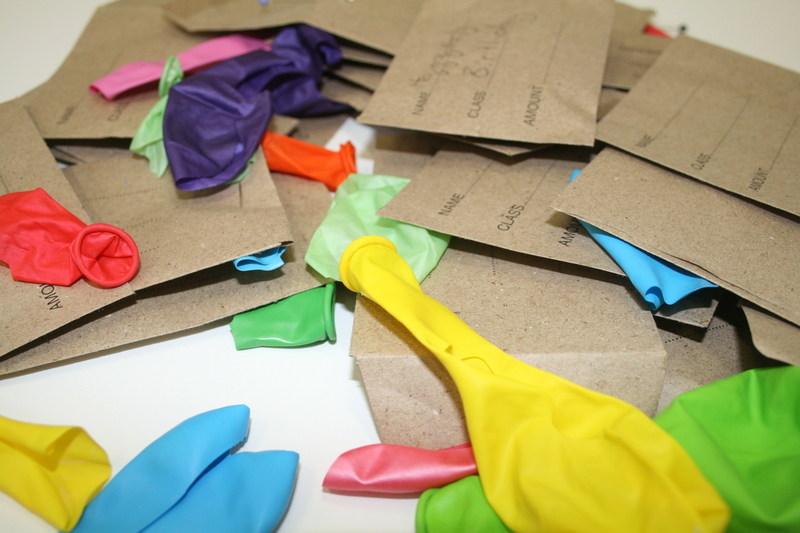 Galleries are working to precedence – literally and metaphorically. And sound, whether presented on its own, or combined with film or in an installation, brings formidable challenges – of audibility, sensitivity and containment and the need for in-house technical expertise. Given the role of the gallery as ‘keeper’, I do wonder whether, over time, these practical issues are having a reciprocal, repressive influence, in turn, on the direction and pace of development of sound in art-practices per se. Have they served to encourage a continued ghetto-isation of the field of sonic art in its purest form – the art purely of sound? Is the potential for new works in sound or mixed media with sound being influenced or discouraged by the primacy placed on visual over sonic media in mixed media works of art or shows? An artwork, or a message on a wall about an artwork? An artwork accessible to 70% of the population – those with smartphones. I am one of the 30% – mobile but not sufficiently smart. The National Gallery, where the message is displayed, has no phones or alternative listening devices on hand to lend. I did ask. 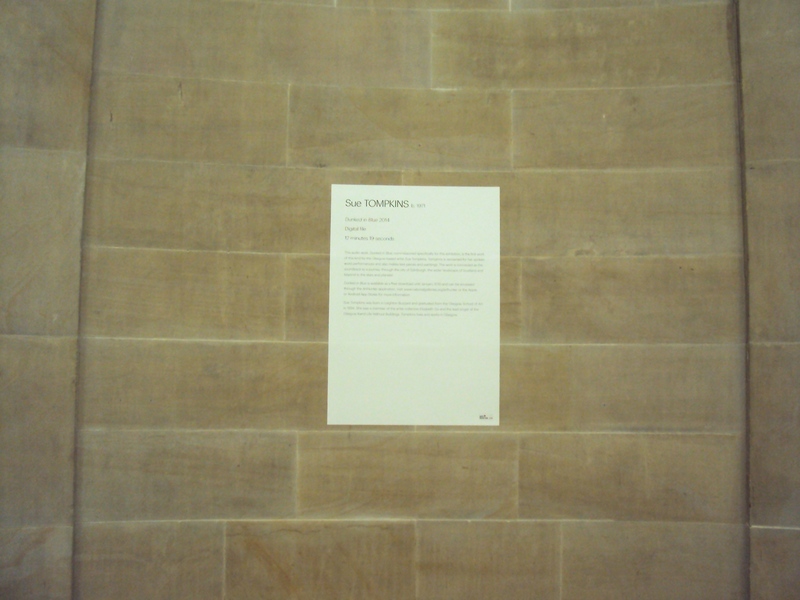 So I stand, reading the message again wondering when technology became a barrier to accessing art in a public gallery – where access in the form of various technologies – wheelchair ramps, audio guides, lifts – are a basic requirement. The ‘smartening’ of the entire population may well come, or near enough. What of the meantime? 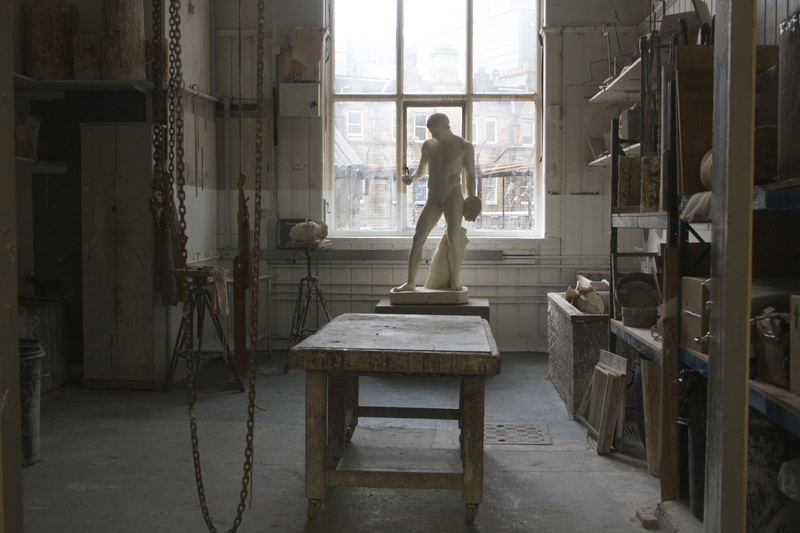 This new work, which links the immense sculpture court of the Edinburgh College of Art (ECA) with its comparatively diminutive casting room through sound, incorporates an installation with pre-recorded audio and a live performance of the recorded work. The audio is based on the excerpt from Henry Purcell’s Dido’s Lament (see previous post) which I have scored and sung in reverse as a short solo and as a six-part canon with a choir. I performed and recorded these within the vast and beautifully resonant sculpture court of ECA in order to transpose the recording into the casting room as the central part of an installation. 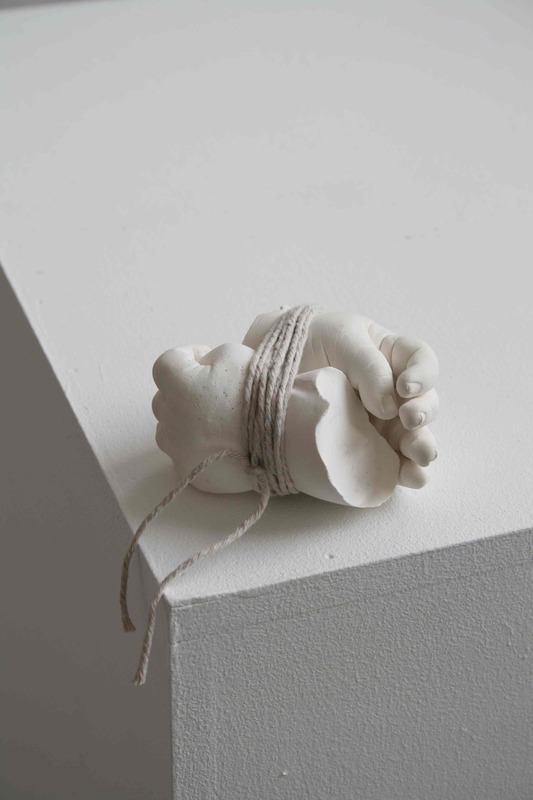 The second part of this diptych, the live performance of the vocal score within the sculpture court of ECA, took place at the degree show opening on 22nd May, 2014). You can hear an excerpt from the live performance here. All recorded sound, as it is played back, is the realisation of a copy. To take the metaphor of casting, the recording is the mould through which the copy of the original is produced. That makes the original the sound that was made ‘live’ in the first instance. The value of a cast depends on the quality of the mould, the number of issues made and on the perceived qualities of its original master. So too the value of a reproduced sound. But, a cast is never its master, only an approximate facsimile at a moment in time after which both cast and master travel along different paths to different destinations. 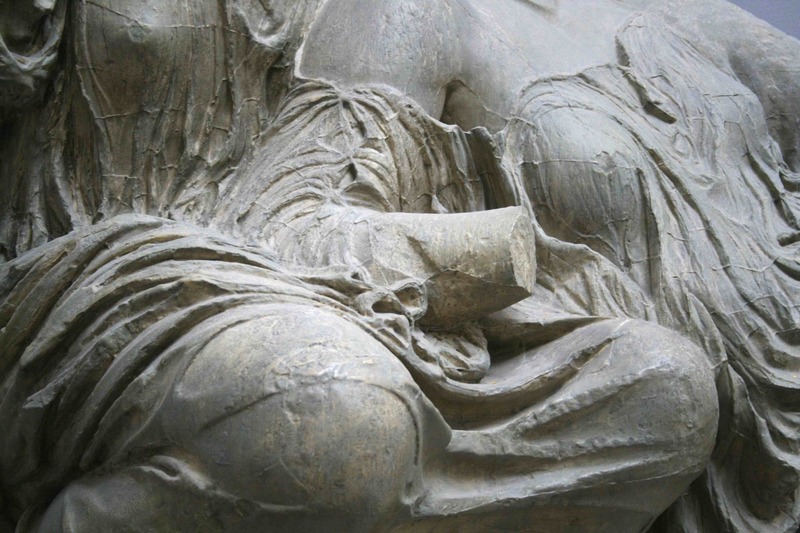 It may become the master of another cast, not the duplicate of the original master but a flawed facsimile twice removed – the replica of a replica – the print of a negative taken from a print – a diminishing echo. The casting stops and the room is silent, when the value of the original has lost its meaning. I’ve been messing around, digitally manipulating body sounds and odd domestic sounds – but, so far, it feels cold, and calculated. Predictable. – it is the Innocent Tunnel track, in reverse (listen). It is not simply because the voices are reversed, but the reverberation is reversed too. There is a feeling, for me, of moving backwards through a space. It’s perhaps an interesting sound to play back out of context – maybe from within a tightly confined space, or from under floorboards. It has also got me thinking about making sounds backwards – not recording them, but creating them in reverse direction. Like the sounds and smells captured in the reverse narrative of Martin Amis’s Time’s Arrow.